When Community Investment Holdings was founded twenty years ago, the vision was very clear: to join the mainstream economy and today the company has grown in leaps and bounds with interest in six vital areas of the economy ; healthcare, technology and telecommunications, logistics, mining, power and energy. “We are here to celebrate black industrial excellence and usher in a new chapter in black economic empowerment. The Black Economic Empowerment has grown and transitioned to a new level with an emphasis on industry,” Premier David Makhura said. The Premier was addressing black industrialists attending the celebratory dinner to mark twenty years of Community Investment Holdings founded by Dr Anna Mokgokong and Joe Madungandaba. The company associated with big brands such as Adcock ingram, Putco and Schneider Electric has become a major player in transforming the economic landscape of the country. Part of Premier David Makhura’s economic transformation strategy is to break the monopoly-structured economy that excludes the majority of the people from the mainstream economy. “We need to see black companies producing services and products that we can sell in many parts of the continent,” said Premier Makhura. The black industrialist programme championed by President Jacob Zuma will be one of the land mark achievements of the current administration. Addressing a conference room full of business people, President Zuma said the country must develop knowledge in order to succeed. “Knowledge is a necessary tool for development. We have taken a huge decision to invest in infrastructure to move trade and goods”.“This country will never prosper if the majority of the people are not part of the mainstream economy. 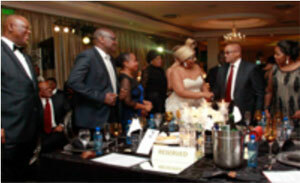 In many countries the majority are in charge, in control and in the mainstream,” said President Zuma.